February is Heart Health Month, but choosing a heart-healthy lifestyle is a great thing to do any time of the year. A few ways that may help reduce the risk of cardiovascular disease may include engaging in regular, moderate exercise, managing stresses, and adopting a diet filled with heart-healthy foods such as whole grains, fruits, and vegetables. Blueberries are full of soluble fiber and phytonutrients (such as flavanols) that may help prevent disease and help keep your body working properly. These little blues are easy to add in breakfast cereals, smoothies, or as a fresh snack by themselves. 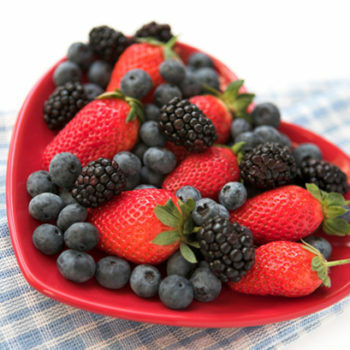 Show your heart some love by nourishing it with a heart-healthy diet. Here are “15 Foods That are Good for Your Heart,” recommended by the Cleveland Clinic.